It’s winter in Earth’s Northern Hemisphere. I know this because I saw someone on Facebook post a photograph depicting snow-covered patio furniture. Otherwise, I’m here in the Siemsen Sanctum, cut off from the outside world as I write, day and night, striving for just one more book release (I like to focus on highly attainable, short-term goals). First, the long-overdue EXIGENCY Audiobook Edition has finally arrived today. As I mentioned in a previous post, I’m ecstatic to have award-winning narrator Julia Whelan voicing Minnie and the team. Exigency is a fairly complex novel to read aloud (and have make sense to the average listener), and Julia’s performance is everything I hoped for, and more. Next, we have two new releases coming in my Demon’s Story series: Frederick & Samuel (A Demons Story), the even-longer-awaited sequel to A Warm Place to Call Home (A Demon’s Story), as well as the not-as-long-awaited sequel to The Many Lives of Samuel Beauchamp, which happens to be the prequel to A Warm Place to Call Home (A Demon’s Story), but before all that, I’ve got a short pre-prequel story coming in just a couple weeks called A Memoir of an Encounter with the Malevolent Entity Known as Gregor the Demon by Dr. Freidrich Breiner, which is a prequel to all of the above. It makes sense … somehow … Trust me. For those only now embarking on their daimonic journeys – Though one can read the two existing titles in either order, I think you’ll get more out of reading them in the order they were released A Warm Place to Call Home [Frederick’s story] → The Many Lives of Samuel Beauchamp [Samuel’s story] → A Memoir of an Encounter… [Gregor prequel short] → Frederick & Samuel [continues from end of both existing novels]. 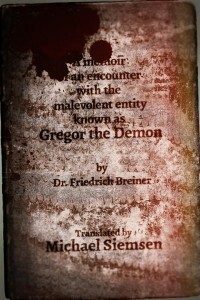 A Memoir of an Encounter with the Malevolent Entity Known as Gregor the Demon by Dr. Friedrich Breiner comes out Friday, Feb 12, 2016. Preorders for A Memoir of an Encounter with the Malevolent Entity Known as Gregor the Demon by Dr. Friedrich Breiner will be live soon. Frederick & Samuel (A Demons Story) comes out Tuesday, May 10, 2016. Coincidentally (not coincidental), preorders will be live on Friday, Feb 12, 2016. And here’s a visually stunning graphic of that reading order we were discussing earlier. Finally, just before Frederick & Samuel‘s April release, we’ll see my entree into the storied halls of The Future Chronicles sci-fi anthology. My contribution, The Shepherd of the Brilliant Valley, will appear in the series’ first special edition, the Illustrated Robot, coming out March 25.